58th Merdeka day coming soon. This day is also known as Hari Merdeka in the Malay language and that is why the celebration of Independence Day is incomplete without the seven shouts of “MERDEKA!”. This gesture was initiated by the First Prime Minister of Malaysia, Tunku Abdul Rahman back in 1957 at Dataran Merdeka. It’s a very special day for Malaysian and of course the most important is HOLIDAY! There will be a lot of events, concerts, street-outing and gatherings happening on the 31st of August. Finding the right corporate gifts for a particular occasion is always a challenging task. The corporate world is full of stories where good products could not make a mark due to improper promotion. The promotion of brand is so crucial that it has lead to evolution of a set of promotional companies which specialize at promoting brands. 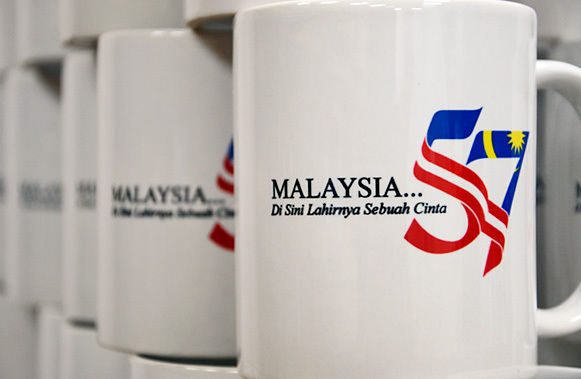 * White Mug Printing order from a corporate company in year 2014 at My Bulk Print Sdn Bhd. Promotional corporate gifts and corporate logo gifts are excellent picks that fall under a large range of groupings. Gifts to this nature superbly promote the company and concurrently show appreciation in conjunction with Merdeka Day. CALL us at 019.3233.812 or 019.3236.933 to ORDER Your Personalised Corporate Gifts NOW!